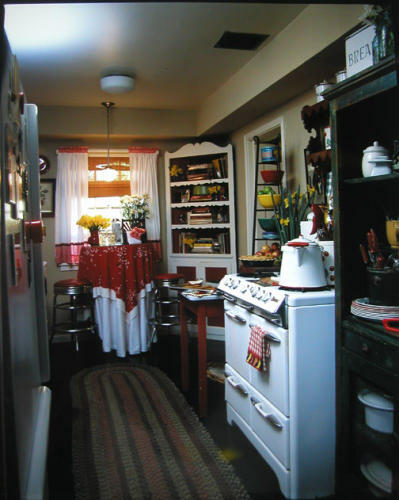 RETIRE IN STYLE BLOG: Re-decorating: Kitty Bartholomew where have you gone? I loved Kitty Bartholomew on HGTV! I know that dates me but I cannot help it. In fact, I woke up the other day thinking how much I missed those HGTV shows that inspired me to create and recreate. She made me feel at home in my home because the message was that little changes made a big difference. I could do it myself. I still watch HGTV but after a while every show is the same. If you have wasted enough time watching Property Brothers or Love It or List It, you know what is coming next because, in the end, every decor is the same. Nothing reflects the fact that anyone lived there. If you do it their way, a trip to the local big box store is all you need to decorate any apartment or home. What each place is missing is the layers of life we bring to our dwellings. A home is so much more than furniture placed correctly or even the pictures on the walls. It is those personal items that make the difference. Moving is a real test of your ability to make a home. Downsizing is a challenge in particular. All the "stuff" you have chosen to keep comes with you and now the task is to make a nest where you can feel as though it reflects who you are. But most people don't move with the thought of hiring a decorator...it is expensive to move. Yet we all want a fresh look. As a result, you have to take what you have and make it work. Someone told me once that when my husband and I moved, you could not tell we had just arrived. It was just us from top to bottom yet it all "looked" new. I use this same technique when I arrange furniture or gather a table top arrangement. I can use my formula for my home and it looks okay. But Kitty knows that a home is where you live. Every item in her rooms seemed to say that she put her hands on it and made it her own. I always had the feeling that each piece had a story and she could tell you where it was from and why she loved it. I want to be like her. When you come in my house, you will know that what you see is what my husband and I love. My husband is the ergonomically correct person and he wants to have his things at his finger tips. I have come to love that. His clutter is a thing of beauty because it tells me that he is at home too. I suppose this fact explains why the walls are not pink and covered with flowers. Our home is a shared space. So, Kitty Bartholomew wherever you are, thank you for making it okay to "live" in my little house with a cat that sheds and a husband that nests. Even as our home gets smaller we feel comfortable. In my eyes it is beautiful. You have given me a very special gift. I miss her too!! Back then, HGTV was the BEST program ever. They took the HG out and added HHTV ...House Hunters TV. I have seen just about one too many House Hunter's programs which has very little to do with Home and Garden. I think we appreciated it because it was such a treat. I AGREE.. I miss our Kitty too. That girl had such unique style and fabulous originality that is no where to be found on HGTV these days. I wish she would do another show! Along with missing Kitty's show, I miss a variety of shows throughout the day and evening. HGTV started it, and now it's mostly back-to-back-to-back programming of the same thing for hours on most channels, so I find myself reading more and watching TV a lot less! Miss the old HGTV shows.Kitty you were great and and great projects.Hgtv is so boring now!!! HGTV recently deleted its decorating board as well. 5 day warning it was going to be deleted. Yes, I agree. Why did HGTV switch to house hunting and love it or list it? People need help with using what they've got too. I miss Kitty, Lynette, and the Room by Room, and the one that showed high end rooms, then showed you how to get the same room for less. There are so many I have forgotten their names. Maybe they overdid that trend too and killed their own viewing audience. I love Fixer Upper too but can see where they might run out of original ideas after a while. Another favorite is Rehab Addict. That woman is forced to be creative just by the very fact that she does not "tear out that wall to open it up" but instead restores very old houses giving them a modern edge. I like that a lot! As for where Kitty is...I have no idea. Just found your blog, too, and just last week I ordered Kitty's 2005 book, "Kitty Bartholomew's Decorating Style". I agree, she's missed these days. I no longer watch HGTV because the shows are bland and silly. Even House Hunters is irritating because obscene amounts of money are spent and so many who are looking for a house expect everything to be new. When did that happen? The early shows were much better: This Small Space and Aaron Foster's FreeStyle are two shows I liked that haven't been mentioned. I am going to check those shows out. I need a fix every day. I think a lot of women feel the same way. But HGTV is evidently not making enough money to warrant a diverse schedule...or they have just gotten lazy! I used to LOVE Kitty and her decorating style. I watched all the time on my day off!! I dreamed of having a home like that some day & there were so many ideas for Country Style - so warm & comfortable. Now I never watch HGTV any longer as it is all about House Hunters. or Buying & Selling or Flipping Houses. I hope she knows how much we miss her. I have one of her books & it gives me such pleasure to look at it -time after time! There will never be another Kitty! I try to clear the clutter but it seems to crawl back out. I like to see my life so that is how it goes. I miss the old HGTV shows. Me too! Nothing is the same anymore, other than our memories of days gone by. New HGTV same ole same ole shows, never watch HGTV anymore.